Are you looking to buy or sell a house in Blue Bell, Pennsylvania? Look no further – The Premier Properties Group can provide you the absolute best service for one reason – it’s right next to our home base! Our main office is located in North Wales, PA which is right nearby. Our expertise and knowledge of the area is unparalleled and our range of experience and history there cannot be matched. As the top real estate broker, we pride ourselves in knowing the market, immersing ourselves in the constant ebb and flow of prices, rates, and predictions for the future. The town is conveniently located just miles away from the King of Prussia mall, with plenty of shopping and restaurants to enjoy. It is also quite close to the Montgomery Mall in North Wales or the Plymouth Meeting Mall. 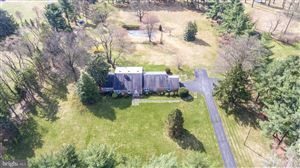 It is also a thirty-minute drive to center-city Philadelphia with easy access to 309, 476, and 76 highways and can be found in the Whitpain Township of Montgomery County. It gets its name from the historically significant Blue Bell Inn, which still attracts many people to this day. The Whitpain Public School was also added to the National Register of Historic places back in 2006. Known for its upscale homes and luxury real estate, this area is a popular family town that many people seek out. There are a number of large executive-style houses, popular shopping areas, small businesses and business parks. Money magazine ranked this town 14th on its list of “100 Best Places to Live in the United States.” This town is also home to the Blue Bell Country Club, Montgomery County Community College, Wings Field Airport and the Meadowlands Country Club. Contact one of our real estate agents today to begin the search for your next dream home. If you are looking to sell your house, Coldwell Banker Premier Properties is here to serve you with the finest level of experience in the industry. It can be a daunting task when trying to buy or sell a house for the first time, so it is important to ask the right questions and work with an experience realtor that is able to point you in the right direction. Our line is always open and feel free to use the contact form to reach us. Ask about our open house schedule!